Today is the start of the one-week countdown before another big bike trip. For some reason, no matter how many times I do this, I always find it difficult to sleep the week before a trip. There is always something that could go wrong – my fault or not, and no matter how many times I go over the plan, it only takes one crash on the bike, a few days of terrible weather, a break-down of the support van, customers who aren’t as fit as they let on, or perhaps my course is more difficult than I let on… so many things can spoil the “perfect” week of biking. To top it off, it is really crunch time at home on the farm. I just got back from digging the irrigation ditches around our rice fields – something that has to be done each year before we fill them with water. Yesterday our neighbor tilled them the first time. Now we have to flood them and till once more. I need them to be ready to plant by the 26th when a group of boy-scouts will be stopping by with their fathers to experience rice planting, and later in the week when my bike tour customers are to spend an hour or so planting as well. Before they are ready we have to fill them with water (takes a few days), till them, and find and fill in all the holes in the walls that have been created by mice and moles over the winter. 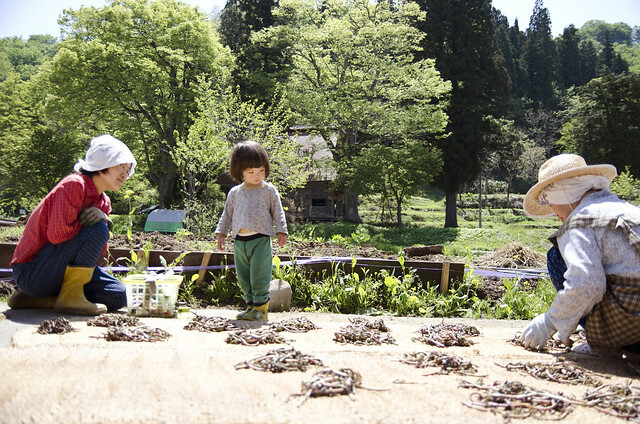 Yesterday Tomoe, Mona and I went to one of our fields up near the mountain and cleaned up, tilled, pulled out weeds by the roots (time consuming, but thankfully Tomoe’s job) and cleared the overgrown mulberry trees slowly encrouching from the edges. In the process I collected a few days’ worth of heat for next winter in the form of mulberry wood for the stove. I have been building raised beds in the back yard for our garden – something that has been on the list for years now. We still have not planted anything, and it is already almost june. There just doesn’t seem to be time, but we know it is something that NEEDS to be done immediately or the entire year will be wasted. I have library books that are a month overdue. When we got them we were certain we would be back in the city within two weeks, but we haven’t been back since. Luckily the new bikes we ordered this year arrived on time and all are in working order. We probably could have gotten by with the old bikes, but some of them are four years on now, and having top-condition bikes takes 90% of the stress off of me, so for these next trips we just went all “F*** the environment!” and got brand new ones. While I was F***ing the environment, I decided I might as well get a new camera. The old D70 was still working fine, but I am also working on a job where photos are part of the deliverable, and I wasn’t happy with the resolution of the D70, plus I wanted video after realizing I have missed 2.5 years of video-taping Mona’s development. I now have a D5100. I like it for the most part. Aside from the auto-focus sound being so annoyingly prevalent in the video audio, I have no major complaints. I realize I have not really looked at digital cameras for almost ten years now. Things sure have gotten fancy. The photos here are some of my “getting to know you, Mr. D5100″ test photos. Speaking of that job that requires some photos. I am only slightly behind on the deliverables for that, but I have missed getting important photos of the short Spring season, now I have to wait another year. Just like the planting, the open window for taking photos is also so short. While I knew I would not have time to do the editing and finsihed product until July, and set the deliverable date accordingly, just as with planting, there is no way I can ask the seasons to wait for me. All the while I am doing this, I am postponing the updating of my Onelife website, and loosing potential business for summer and fall. So now when things finally die down mid June, they will not just slow down, they will be motionless. 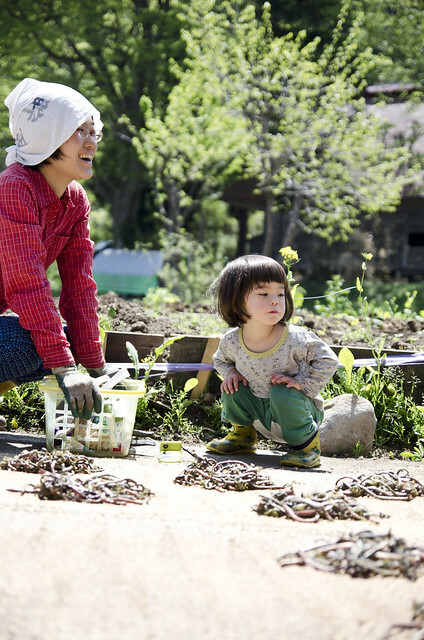 The photos show our neighbor massaging her zenmai ferns. 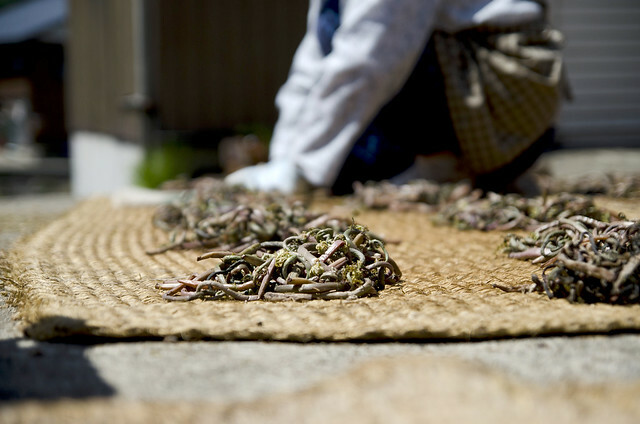 Another spring thing we missed this year, along with many other spring vegetables we had intended to stock up on for personal use as well as for Tomoe’s baked goods. 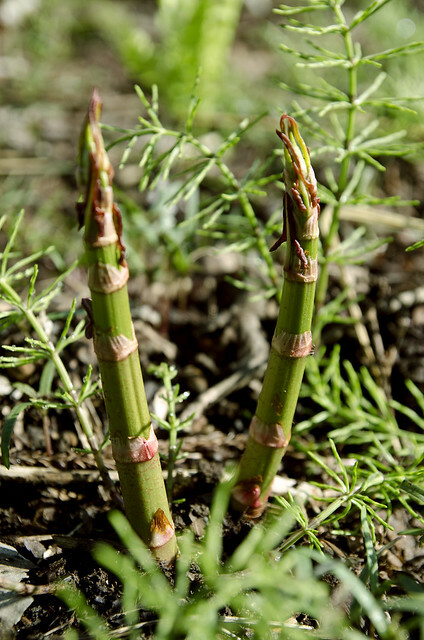 There is still time to gather the just-coming-out itadori (Japanese knot-weed) pictured below. This was once a treat the older people of the village remember eating a children. It tastes like rhubarb, but is a pain to process because it is so fibrous. If Tomoe can find some creative use for this it would be wonderful, as it is one of the more annoying weeds in the area.